It is great to see when a band manages to evolve within boundaries of a well-established genre, while being both true to this genre history and at the same crafting their own path. Case in point Swedish Astrophobos. 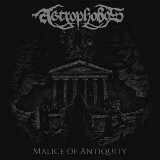 From more melodic to significantly full bodied and denser material Astrophobos has been floating and pedaling the grounds of Swedish melodic black metal. Malice of Antiquity did not change the formula radically, and didn’t extend outside the genus Astrophobos calls home. Yet somehow with 2 EPs and one full-length on their resume already, to me it felt that Malice of Antiquity can proudly announce the band’s true arrival. With Dissection /Naglfar spirited riffs, Taake’s attitude, Marduk ian powerful sound, and even a dash of Horna /Sargeist bestial folksiness and thrashy melodies, but most importantly with the vast power of all Scandinavia behind them Malice of Antiquity proudly stands on the shoulders of its predecessors and delivers black metal in the way I like it. The promise which was somewhat of a glimpse earlier is now definitely fulfilled. To start the album with a blazing speed punch of Fire of Catharsis and Begotten in Black, you wouldn’t even know what hit you, and will be probably processing the impact, jaw agape, when Astrophobos will move and invent new ways to kill. If Fire of Catharsis and Begotten in Black are catchy and immediately accessible, Descending Shaows inserts and twists the knife slowly, double bass pummeling, melody rising and falling, with guitars sounding more like a mouthharp. And so Astrophobos evolves within 40 min of Malice of Antiquity, which fly by in one breath. From absolutely triumphant tremolo (The Nourishing Hate) to windy blizzard (The Summoning Call) to blasting Abbatoir for Flesh and Faith to another punchy punky The Wolves Between the Stars, every song here is blazing with passion, dripping with melody and putting Astrophobos on the black metal map track after track. The vocals of Mikael Broman also evolved from lower Vikingy growl to a much more varied pallete. At one moment he is a nasty snarling demon, suddenly transforming into a hurt disturbed persona, but demonic nonetheless. The band faithfully remains a trio, asking Guiseppe Orlando (The Foreshadowing, ex-Novembre) to help on drums, which he does in a confident powerful fashion. Malice of Antiquity closes with an epic Imperator Noctis where Astrophobos proceeds to flagellate themselves, flay your skin in the process as well, only to elevate the ending by putting it on a ritualistic pedestal with a slight, non-cheesy touch of female vocals (you really need to pay attention here), courtesy of Elisabetta Marchetti. From thrashy start to grandiose closing here is one album in the early days of 2019 I can say undeniably caught my attention and maintained its grip throughout.